Harvey Levine, of Levine & Miller, spent most his career as a bad faith lawyer in insurance litigation. His first job was as a legal liaison for the United Nations in Rome. He came to San Diego in the early 1970’s to take a faculty position at the University of San Diego School of Law where he taught torts and insurance litigation for 20 years while practicing law full time. 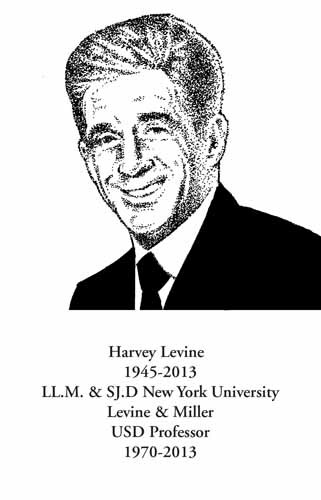 After growing up in Brooklyn, N.Y., Mr. Levine went on to receive three law degrees—his J.D. from St. Mary's in Texas, and his LL.M. and S.J.D. from New York University. While his career focused on representing the little guys, those fighting insurance companies that refused to pay claims, he also took on some clients such as the San Diego Chargers and a former Chargers player. His practice also represented numerous clients in personal injury cases. Mr. Levine had more than 70 cases with verdicts or settlements in excess of $1 million. Those wins include everything from a $12 million settlement with Lloyd's of London after San Diego Padres pitcher Randy Myers suffered a career-ending injury, to his well-publicized $120 million verdict against Allstate for alleged price gouging of homeowners' policies. He represented one of the children of Jennifer Strange, the Sacramento woman who died from water intoxication in a water-drinking contest. Former Chargers linebacker Steve Foley, who was shot by an off-duty police officer during a traffic stop, was another prominent client. Mr. Levine was an avid runner who completed over 70 marathons, including eight Boston Marathons. He also competed in several Ironman Triathlons.